Every cat has a story and on September 1st I learned dear drooling Joey’s story. First of all, Joey is a girl! I totally need to work on calling “him” a “her” now. Joey was living with an elderly couple. The husband had Alzheimer’s and the family was placing him in a facility. Happily, the wife could go live there as well, and still be with her husband. Unhappily, they couldn’t take their pet cat. They found Room 8, who agreed to take the cat who, they said, was 25 years old. Well, two years later we are very sure Joey was not 25. 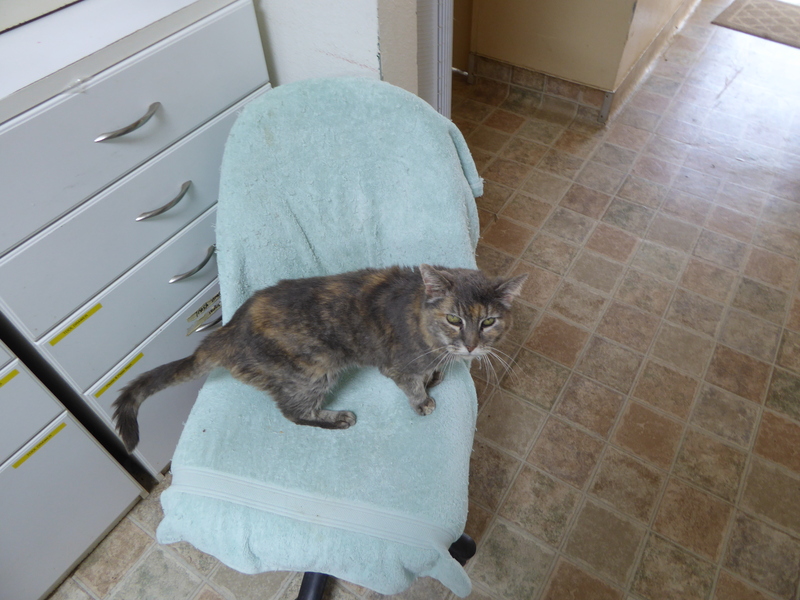 But this story explains why Joey so dislikes the cattery and so likes to roam the hallways and find a nice office chair to sleep in. It feels more like a home that way. Sigh….. 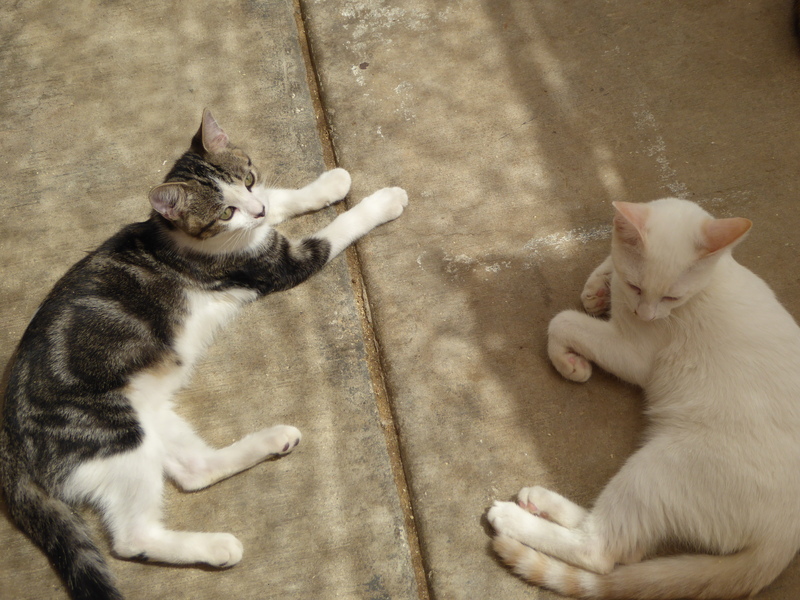 It was hot at the cattery on the first day of September, because we were still in the middle of our heat wave. The fans were going, however, and I think the cats were more comfortable than the humans. 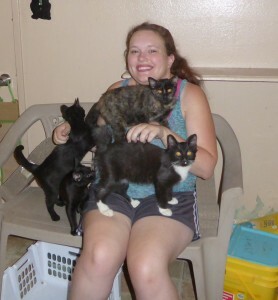 Given how many of the older kittens wanted to pile on Eldest Daughter, I would say they didn’t mind the heat at all, or the heat generated from her and so many cat bodies all piled together. The little white kitty with the unique ringed tail was my friend today. 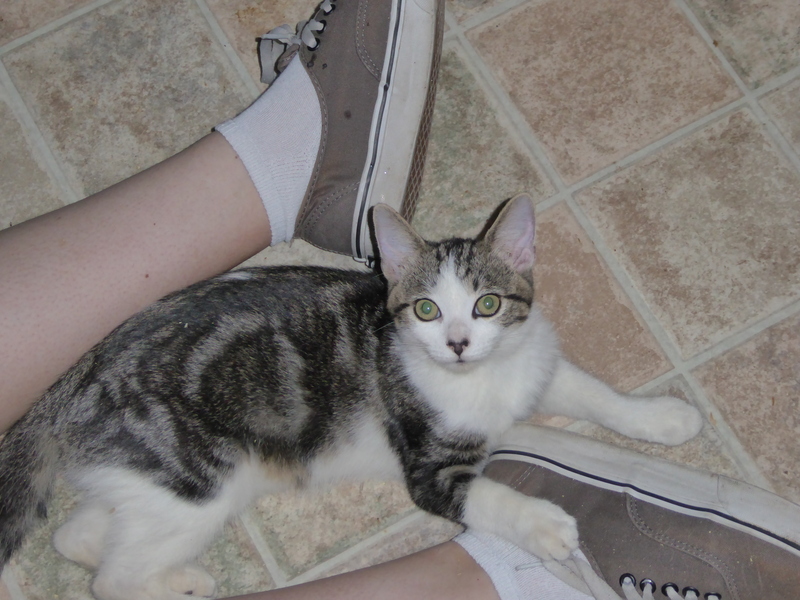 It started purring the minute I picked it up and it wanted to stay with me always. Double sigh. Such a lovable cutie! Here are some more photos of the older kittens today. I wasn’t able to get to Room 8 for a couple of weeks, which makes me feel guilty. There are a lot of cats over there that need human attention! So, with a fire in my belly and a need to pet cats in my soul, I made sure I got to Room 8 last Friday. When I walked in who was curled up and snoozing on an office chair just inside the door? Dear drooling Joey. So you know what I did first. I picked him up and sat down in that chair and we cuddled for awhile. Joey, for whatever reason, doesn’t like to be cooped up in the elderly cat room. 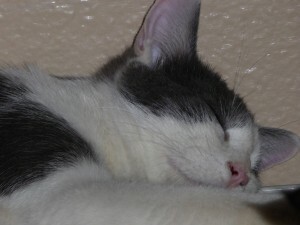 He likes to get out and see the world and sleep someplace different, and he lets everyone know this. So he gets let out to roam the hallways of the cattery on occasion. This is the look Joey gave me when I finally got up and put him back in the chair. 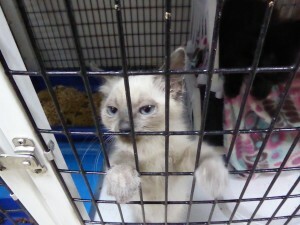 Eldest and I spent most of our time in the elderly cat room and the kitten room. 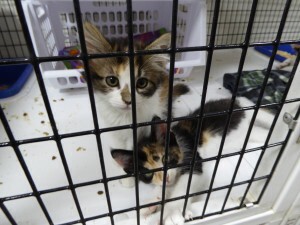 The really small kittens are kept in large crates. 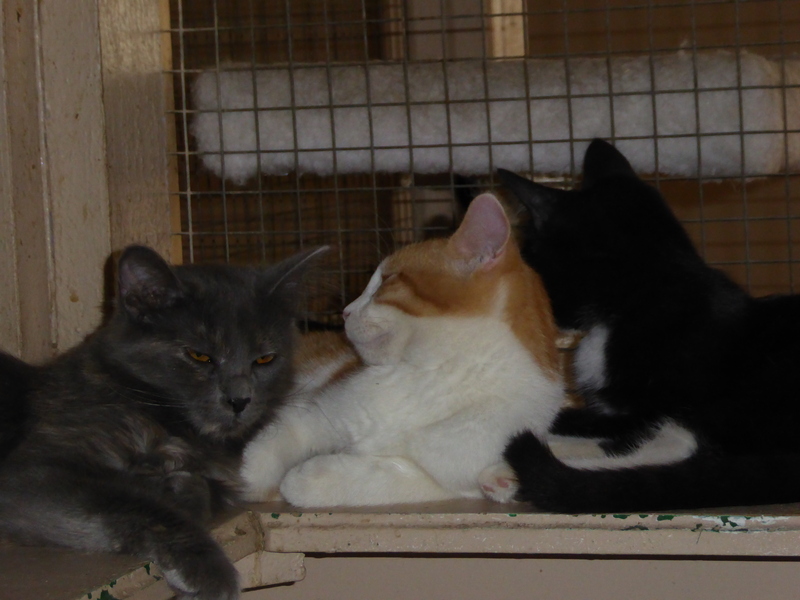 As they get a little older, they are moved into the kitten room. I picked these two rooms for two reasons. 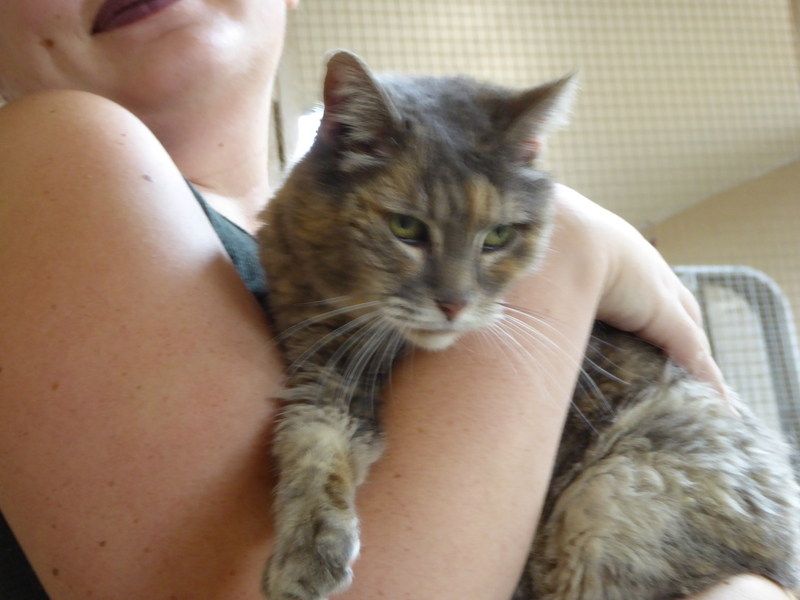 The elderly cats are less likely to be adopted and so I feel they need the most love and attention. 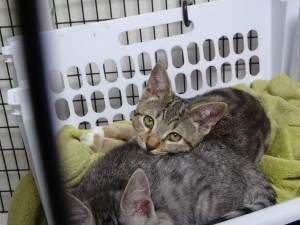 The kittens need ongoing interaction with humans in order to make sure they are properly socialized and therefore more likely to be adopted. 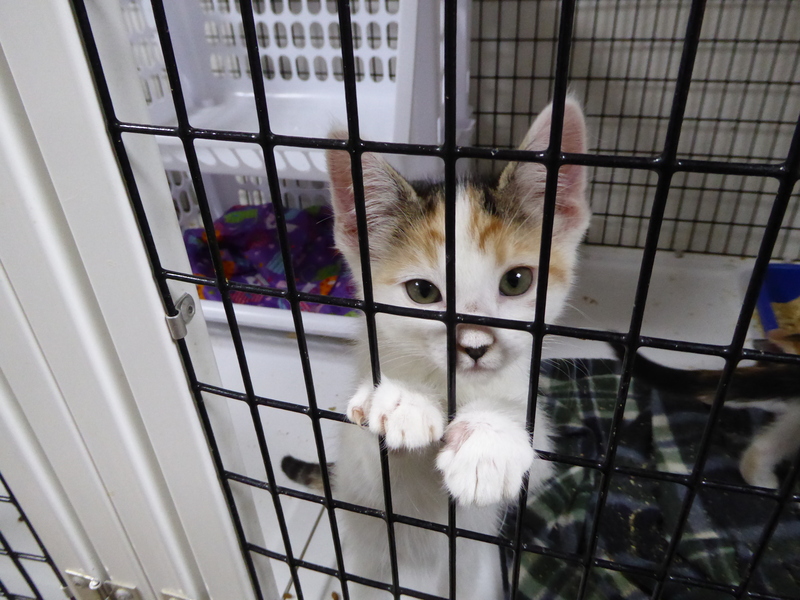 The following photos are all from the kitten room. We had a couple of kittens, a short hair tortoise shell and a black and white with long hair, who were all over us. They literally lept on us when we came into the room. It is so nice to know you are wanted! LOL! Sorry for the dark photo, but here is the tortie draped on my shoulder. 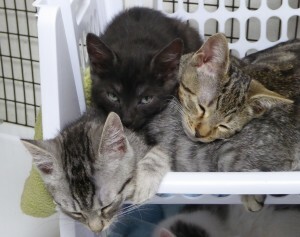 A little nap time on the shelf. 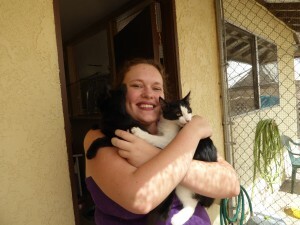 A litle black one and the black and white one who was gnawing (in a nice way) on Eldest. 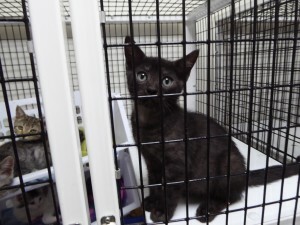 I think these were two black kittens who had the most amazing amber eyes. Seriously, it doesn’t get much sweeter than this! They have every color cat you can think of at Room 8. The one on the right is all white except his tale, which has pale cream strips. Pretty Kitty Nap Nap time. 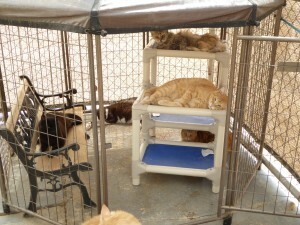 Out on one of the patios, there is a shade structure with some things inside for all the kitties the lay on. I count five inside. Do you see any more than that? 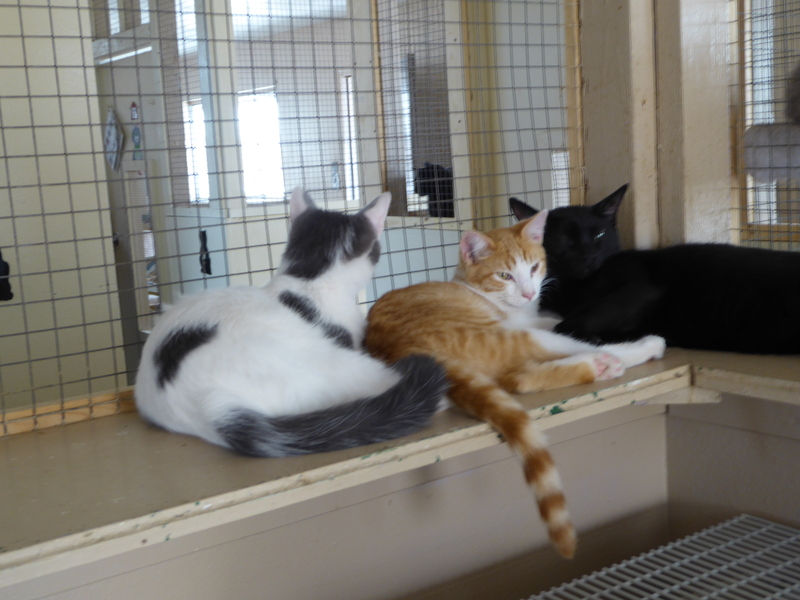 This was taken in one of the adult cat rooms. Anyone who thinks cats don’t have that connection to people dogs do needs to spend time at Room 8. I agree there is a wider variety of cat personalities and you have roommate cats who just like to hang around you and then you have those that crave more attention. 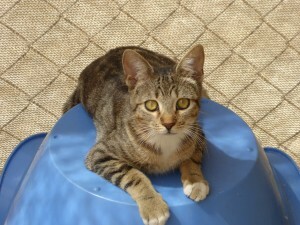 But any cat that is not feral at Room 8 craves some level of human interaction. When we came home from Room 8, our three were in the middle of their own Pretty Kitty Nap Nap time (as we call it0 and pretty much ignored us. But that is OK. They get all the love and attention they need and want and don’t need to jump us to get it. 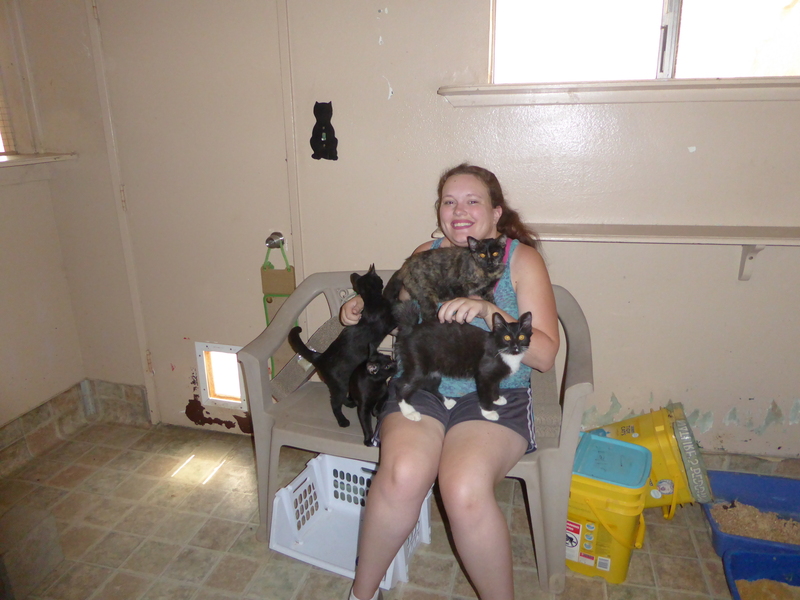 It was a warm day at Room 8, but the kitties didn’t mind and Eldest Daughter and I didn’t either, except that cat fur tends to stick to you when you are sweaty! Oh well! Nothing a shower can’t cure! 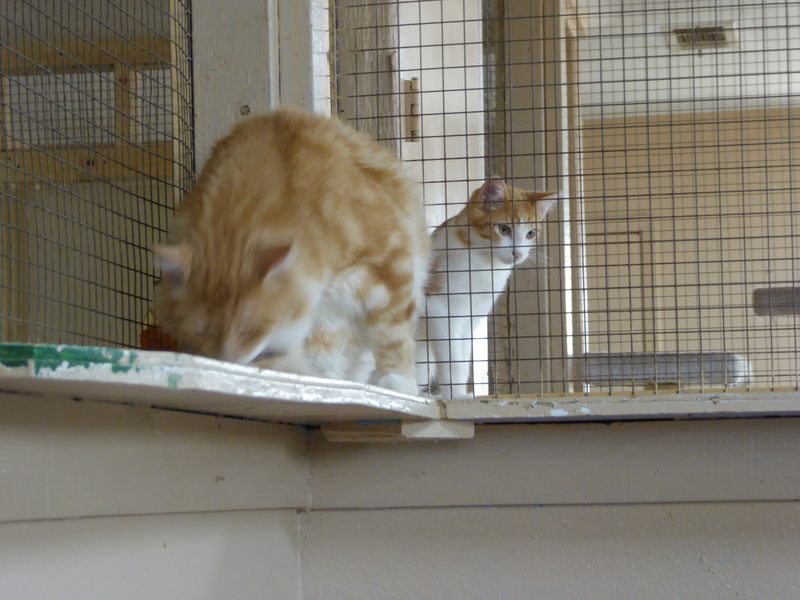 I had a task today – find the new cats, pet them and figure out their personalities so I can write up a little blurb about them for later posting on the Room 8 website. 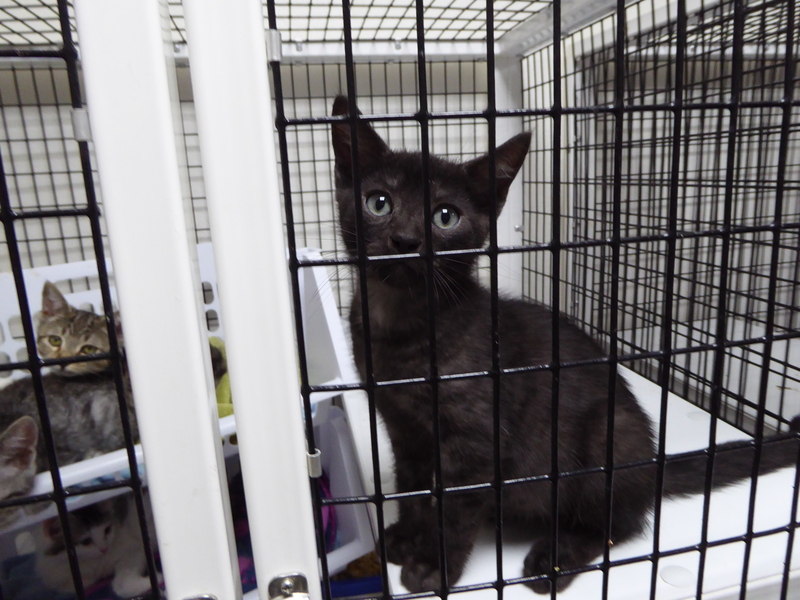 Unfortunately, two of the cats I was supposed to get to know were either skittish or sick, so I couldn’t get those descriptions. 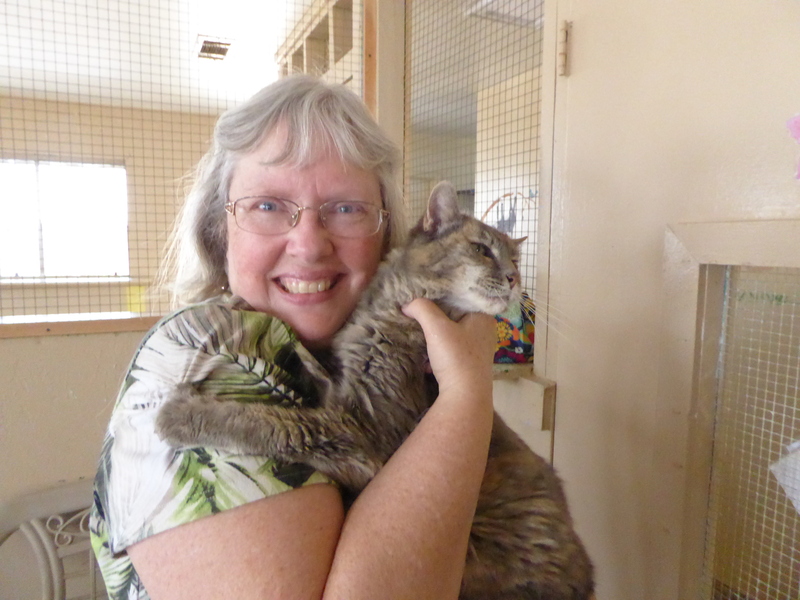 However the third one, Anna, was a sweetie and I got to pet and get to know her. All cats have funny quirks (I think the term “quirky” was coined by a cat owner) and hers was to give you several quick bats on the hand if you did something she didn’t like. I was petting her head and back when she laid down on her side. I gave her belly a quick rub but she apparently didn’t like that and my hand got batted. I kept getting the batting routine for about five more tries to pet her (not on the belly), until she decided I had been “punished” enough I guess, and then it was OK to go back to head and back scratches. She didn’t bat me with her claws, so she wasn’t trying to hurt me. She was just letting me know what she did and did not want. 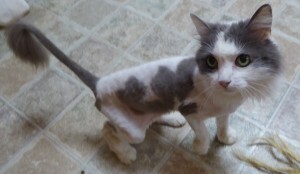 Eldest took a photo of Missy for me to share with you, shaved body and all. Here she is in all her silly glory. 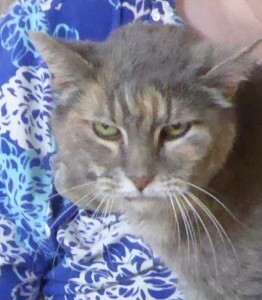 And here is Missy having one of her famous hissy fits at a passing roommate. 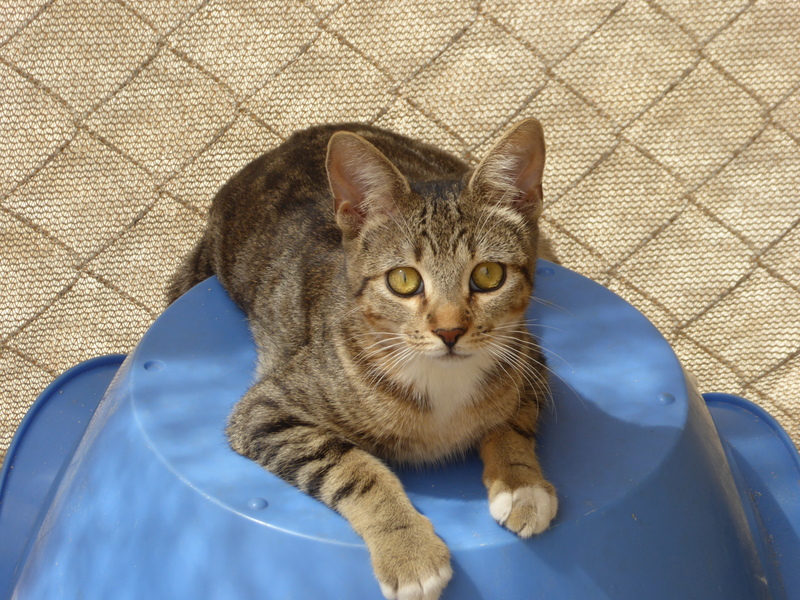 She is such a tiny thing, but has her hissy fits at all comers! 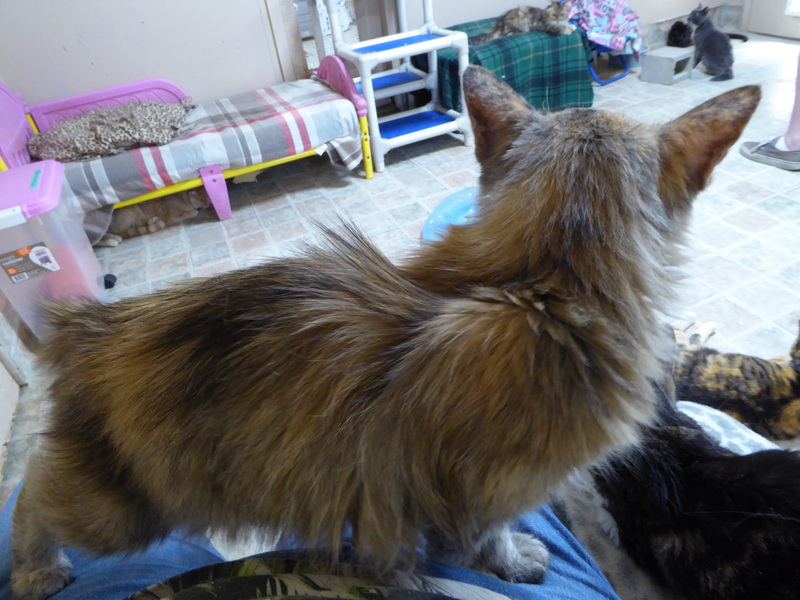 Today all the regulars were up on my lap in the elderly cat room, other wise known as room 6. But this time one more came over and rubbed my legs and let me bend down and pet her. Pretty Peaches was rubbing away while I petted Sukey, Joey, Socks and Angel. Eldest took a photo of her for me as well. Isn’t she pretty? She has such striking coloring. 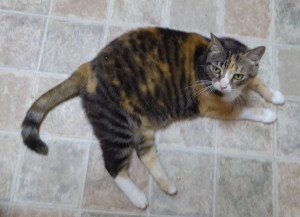 Peaches was very skittish when she first came to Room 8, even though Manager Gail had been told she was a sweet and loving cat. But, as you can only imagine, it takes some cats awhile to get used to living with lots of over cats and having strange humans come in and out all the time. 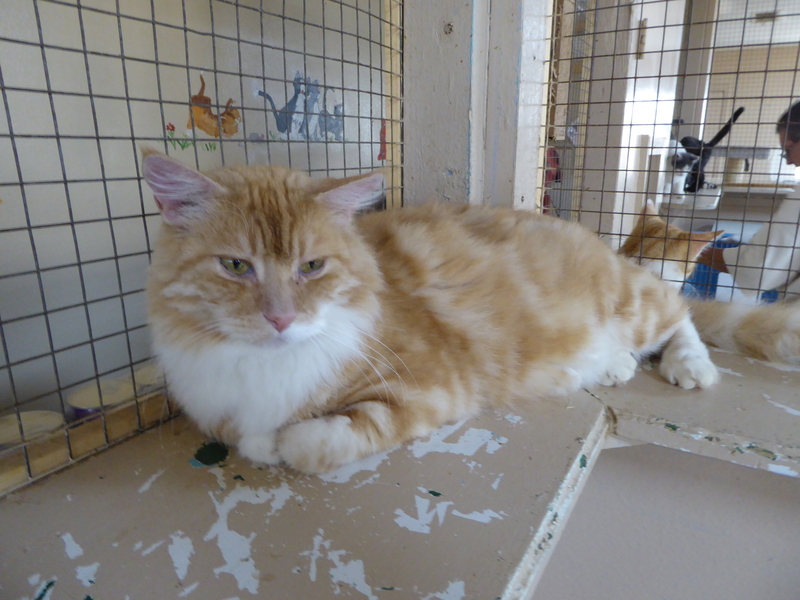 But Peaches is coming into her own now and we hope she will get a family of her own one of these days. 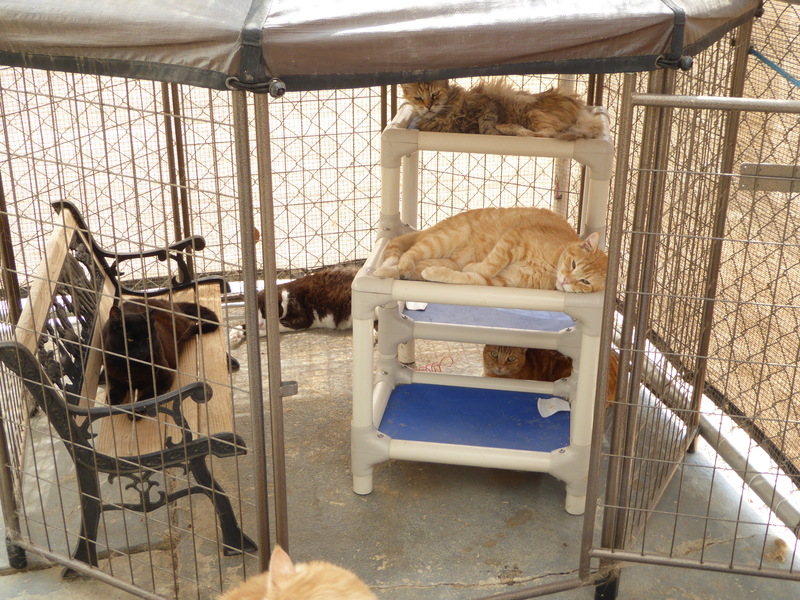 Right next to the elderly cat room is a room that has been turned over to kittens for the time being. The upper part of the walls between rooms is chicken wife, with a shelf below. An older cat whose name (for reasons unknown to me) is Pork Chop loves to hang out on those shelves, giving him a nice place to stretch out and observe the world of Room 6 from a high perch. 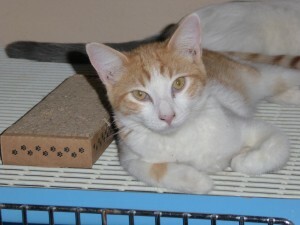 While we were in room 6 he went from one side of the room to the other, and laid down over by the kitten room wall. Pork Chop is his own many. HE is happy to lay around and gt one head scratch a day from a passing human. Otherwise, he enjoys ignoring the world around him. But one little guy was so curious about Pork Chop. But, in normal Pork Chop fashion, the kitten was ignored while Pork Chop lounged or did a little cleaning up. Too funny! You can see the kitten’s head just behind Pork Chop’s back leg. Of course the kitten looked away just as I took the photo. 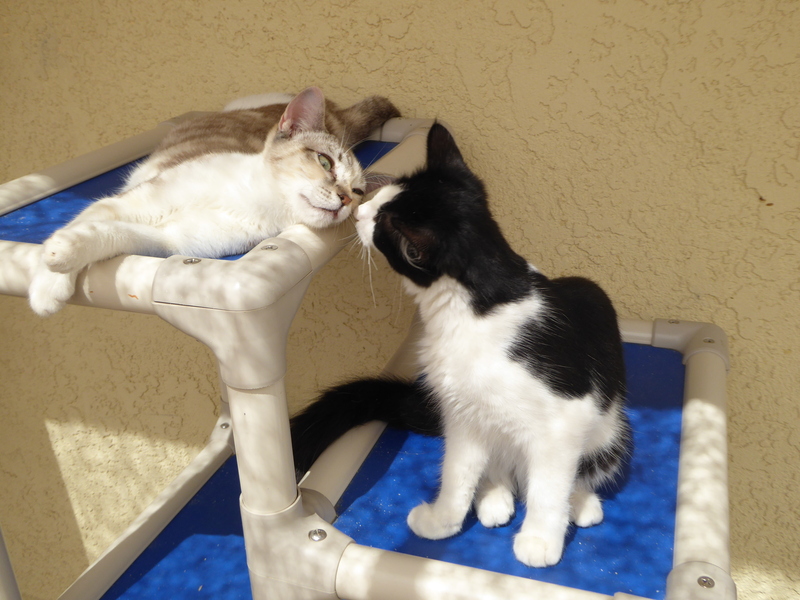 Pork Chop did a little cleaning while the curious kitten just wanted to play. Joey in Eldest’s arms. 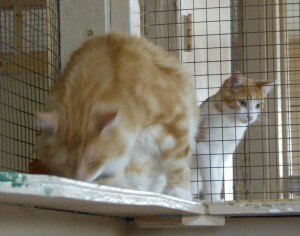 He was meowing to be let out into the rest of the cattery, so she picked him up and that made him happy. This was the view from my lap. Everyone but Angel had jumped down and this little girl came over. 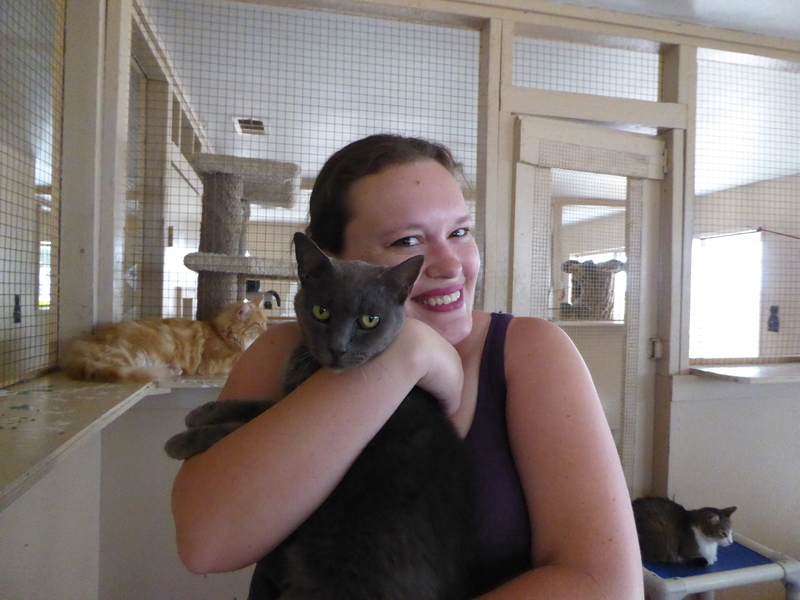 I picked her up, which she didn’t like at all, but it only took a second to deposit her in my lap, and then she was very very happy. I found out her name, and then promptly forgot it. You will have to excuse me, there are a lot of cats at Room 8! 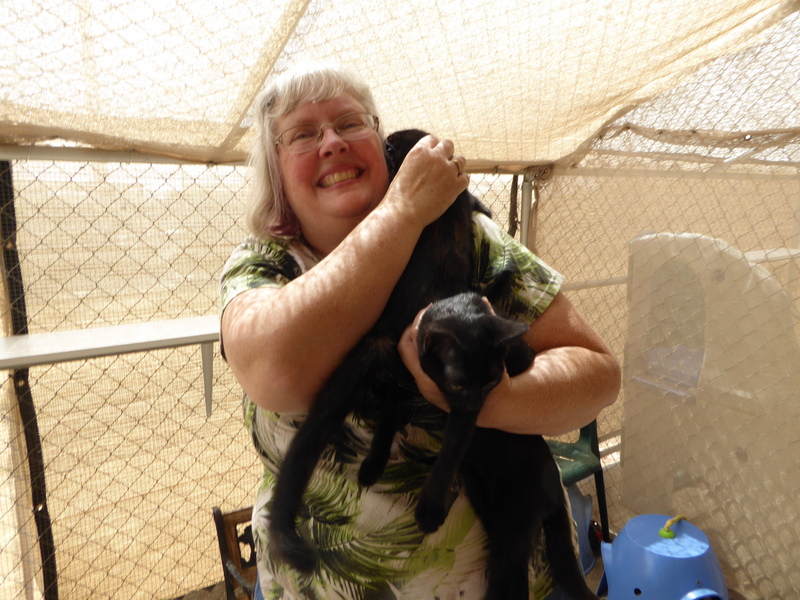 I so enjoy going to visit the cats at Room 8 Memorial Cat Foundation I thought I would start giving updates on what is going on when I visit. Today Gail, the manager, was in for a minute and she reported that 26 cats and kittens have been adopted out so far in July. Whoo hoo! 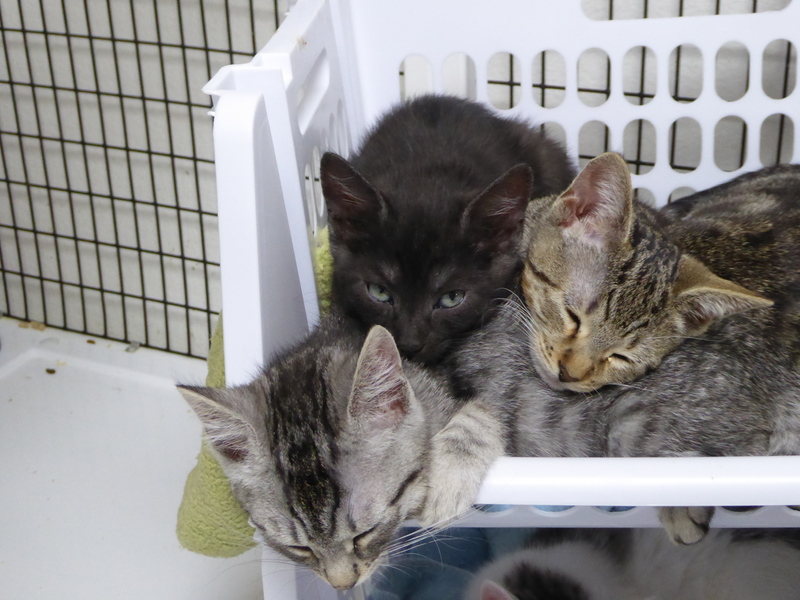 While that is mostly kittens, as it is kitten season, that number did also represent the adoption of some adult cats as well. 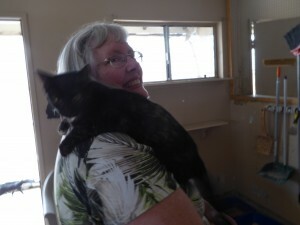 Manuel, the chief maintenance person, said he remembers when they only adopted out four cats a month, so he was excited. On the slightly less good news front, the electric bill for last month was $400. Happily, the cattery got a new roof and new reflective shade cloth for the patios last winter, so it made it possible to add some portable air conditioners and keep the cats and humans a litter cooler in the hot summer months. Otherwise the cats can get stressed out in the heat, I am sure. But that does raise the electric bill! I am happy to report that all my normal oldsters were there to greet me today. 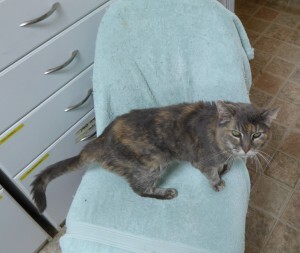 I was afraid dear gray Sukey with the crooked tail might have had to cross the rainbow bridge, but happily she was still there, ready to be petted. As usual, when I sat on the bench, Sukey, Angel, Socks, and Joey (of course) all got up there with me to be petted and loved on. 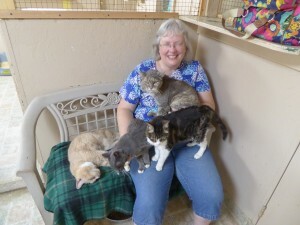 Really, a zen time with all the elderly cats. This was last week, but it is the same cast of characters as this week. From the left is Socks, Sukey, Angel (in front on my lap) and good old drooling Joey in my arms. I looked into the other rooms to see the other cats. 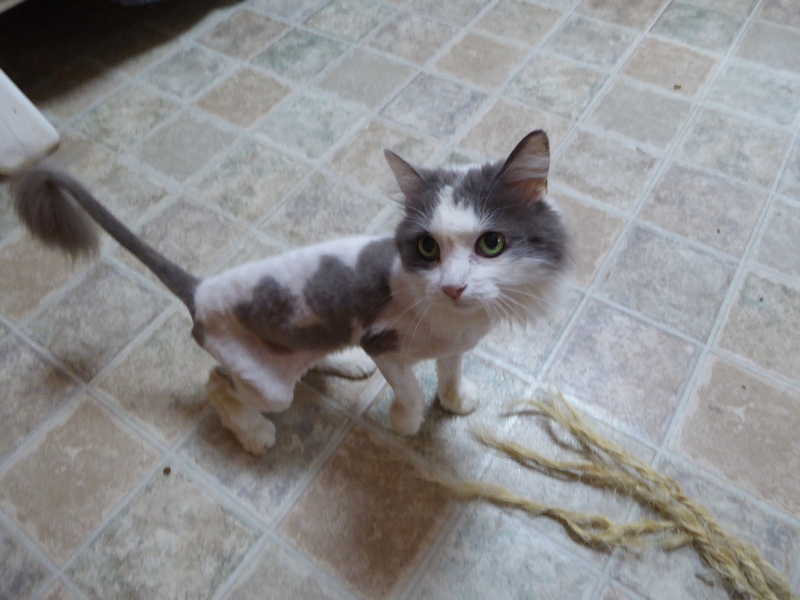 The funniest thing I saw was Missy, a tiny, long haired ball of gray and white fluff had been shaved to eliminate mats and make her cooler in the warm weather. 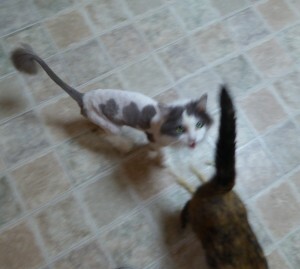 She looked ridiculous, as you can imagine, with just a fluffy head, feet, and the end of her tail. Missy is quite the character. She really does not like living with other cats. 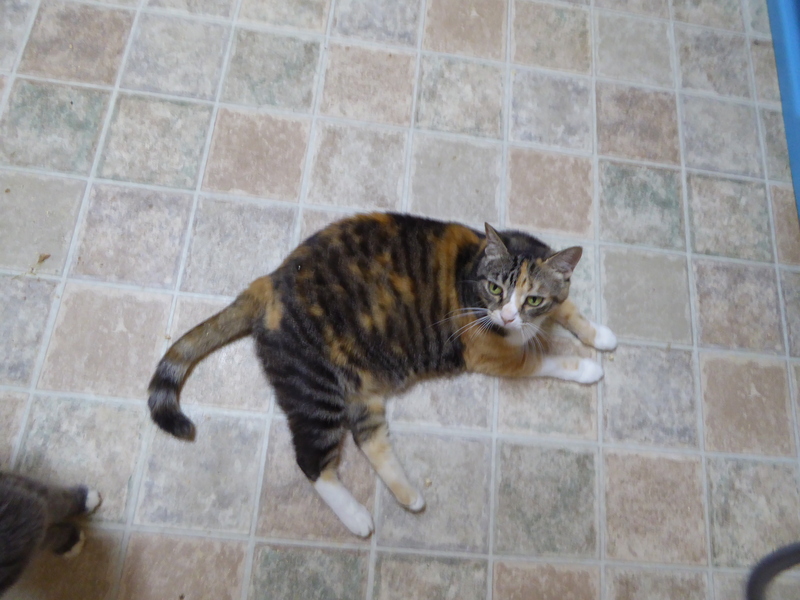 If you are petting her, for example, and another cats gets too close, even if that cat is just strolling by and not trying to horn in on the petting, Missy will start hissing and screeching at the unsuspecting roommate. 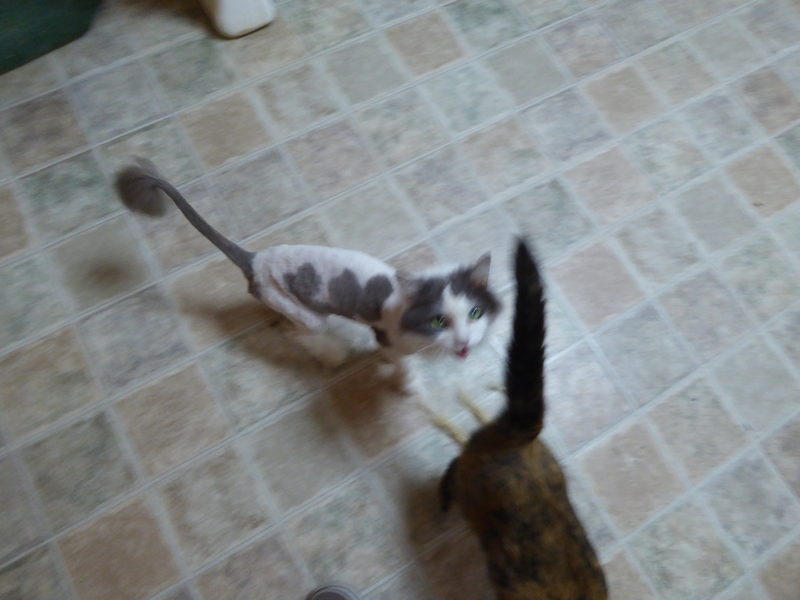 I am happy to report that Missy did not let her recent haircut stop her from having a hissy fit at the cats around her, for any real or imagined misdeed. In other words , it was just another normal Day at Room 8! Room 8 was a cat who became a part of the class in Room 8 at Elysian Heights Elementary School in 1952, and so he got the name Room 8. 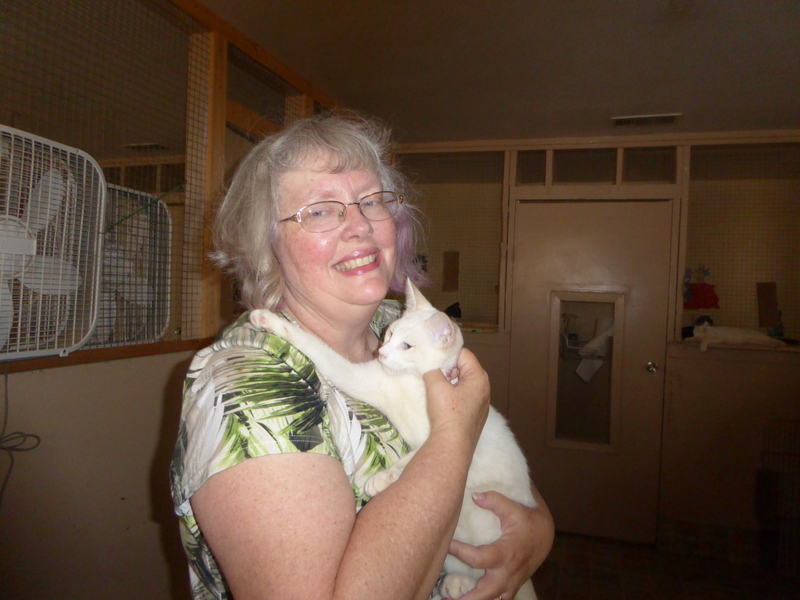 Hettie L. Perry was inspired by his story and decided to name her cat rescue after him. It is located in my fair city, just minutes from my house, and so I can go love on AS MANY CATS AS I WANT any time I want. Yes, I just yelled that because the idea that there are dozens of cats so close to my home, the vast majority of which want me to pet them is really mind boggling in a wonderful, amazing, and purely furry and delightful way. Eldest and I went there last Friday. 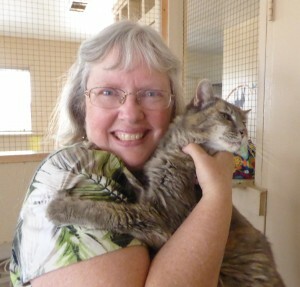 First and foremost, I had to hold and love on my favorite elderly cat, Joey. He drools all over me in happiness every time I hold him. I love it! Me and Joey. Hanging out, getting damp. It is all good! 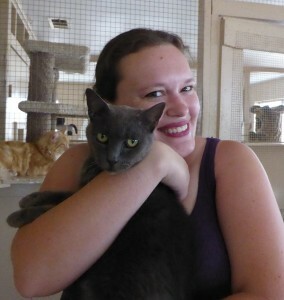 I think Eldest’s red lipstick goes very well with Penny’s dark gray fur, don’t you? 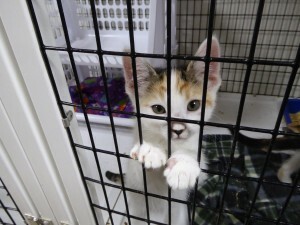 I am happy to report that lots of kittens are getting fixed and getting new homes. Of course, there are lots of kittens still and lots of older cats that need new homes as well. Hubby and I feel that 3 cats is enough in our home right now, but I do hope to adopt from Room 8 in the future, particularly an elderly cat who is less likely to be adopted. Every space made is a space that can be filled by a cat that needs rescuing!